I’ve always been intrigued by old stuff. I’m not just talking about your granny’s vintage hat collection, but really, really old discoveries like ancient artefacts that you would find in a museum and… dinosaurs! I guess I’m a bit like Al Manac in that way – I love history! 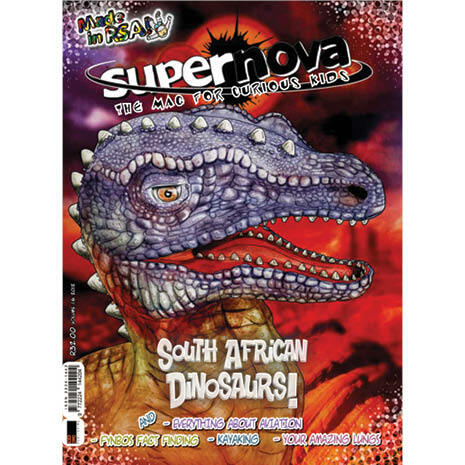 If I weren’t already the editor of my favourite mag (Supernova, of course! 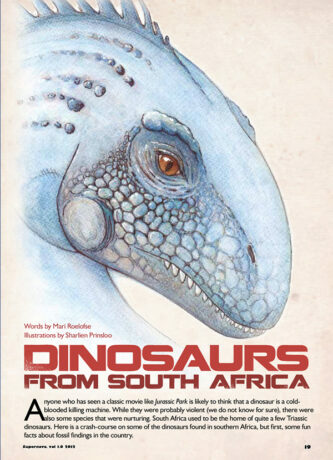 ), I think I may have tried my hand at paleontology… It would have been cool to be the one to discover that some dinosaurs actually lived right here in South Africa! You can read all about them in this issue! Another extraordinary part of our country is Table Mountain, recently named one of the New7Wonders of the Natural World! But there is more to this majestic mountain than meets the eye… It is the home of rare fynbos and holds much intrigue for nature lovers and holiday-makers alike! Speaking of Cape Town, in this issue, our resident pilot explains everything you need to know about flying, while he takes you on a journey from Joburg all the way to the Mother City. I wish I could go too… It would be good to breathe in some fresh sea air! That reminds me – you can check out how your lungs work in this issue too! Also, before I forget, don’t forget to enter our super cool competitions!